Plastic – a material for eternity? Since the start of the twentieth century this petroleum-based material has blazed a triumphant trail through the world of consumption. It is economical, simple to process, and can be given almost any required quality. Today throughout the world 8000 kg of plastics are produced every second. But what happens to a plastic product at the end of its life cycle? Ever since mass-produced plastic products have made our lives easier, the sea has gradually begun to change into a gigantic soup of plastic – every year more than 6.4 metric tons of garbage reaches the oceans and 80 per cent of this garbage comes from the land. As standard plastic is not biodegradable, these pieces are broken up into constantly smaller pieces and enter the food chain. And so our garbage ends up on our own plates. The exhibition Out to Sea? The Plastic Garbage Project created by Museum für Gestaltung Zürich, dissects the different components of this distasteful plastic soup in its first part Plastic in the sea. The composition, application and life span of plastic materials are fed to the mind piece by piece in Plastic in everyday life. 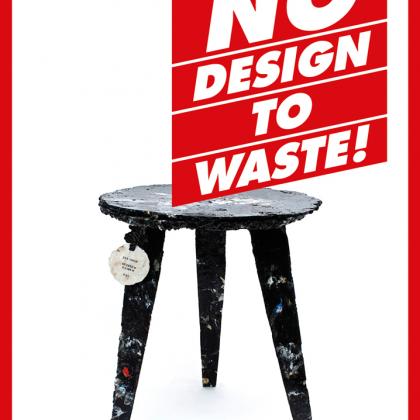 Playful but insisting Design Museum Gent enriches this instructive tale with a large portion of hopeful design, from recycling via upcycling to ecodesign. We formulate this exhibition as a confronting question, without imposing a definitive answer. Is a large production really that necessary? Are there alternatives for plastic? Can discarded plastic get a second life? Or is plastic still a suitable material? As a rule the design of this exhibition cannot be anything else than ecological. Waste becomes building material. Printed matter and exhibition panels are on recycled paper with vegetal inks if possible. Quite neat!